Whitney Duncan is young, blonde and beautiful. She’s also among the never-ending line of contemporary Country artists who acknowledge the influence of Elvis Presley. For many of today’s performers, Presley’s stage presentation made as much of an impact as his music. “Listen to me sing, listen to me talk: It’s obvious I owe more to Hank Williams and George Jones than to Elvis,” said Randy Travis. These are compelling tributes, considering that 33 years have passed since Presley’s death and that 2010 marked the 75th anniversary of his birth  an occasion celebrated at the Country Music Hall of Fame and Museum with a special exhibit, “Loving You: Collecting Elvis Presley,” that will run through January 2011. The milestone was observed well by Sony Legacy through release of Elvis 75: Good Rockin’ Tonight a four-disc set with 100 digitally remastered tracks ranging from hits to rarities; The Complete Elvis Presley Masters a limited edition of 1,000 numbered copies, each containing 30 CDs featuring more than 800 tracks including all of his originally released master recordings and a 240-page exclusive hardcover book; and Viva Elvis, offering a dozen classic Presley vocals in dramatic new settings. Other commemorative products included the DVD collection Elvis on Tour and a compilation of 17 of Presley’s films. But to those who knew him personally and professionally, Presley’s legacy on modern Country Music is understandable. And for Scotty Moore, it might be traced back to one specific event. He should know, being both a witness and participant. Drawing from equal parts Country, gospel and blues, the music they pioneered that night had little in common with the music Moore had been making as leader of a Country outfit called The Starlight Wranglers. The group also included Black, whose wild clowning with his standup bass remained a showstopper even when Presley, also known as The Hillbilly Cat, was wiggling his hips down to his fingertips. Gill admits his debt to his fellow Country Music Hall of Fame member. But as much a guitarist as a singer, he adds that Presley’s sidemen were at least as much a part of what impressed him as the twisting, turning front man. 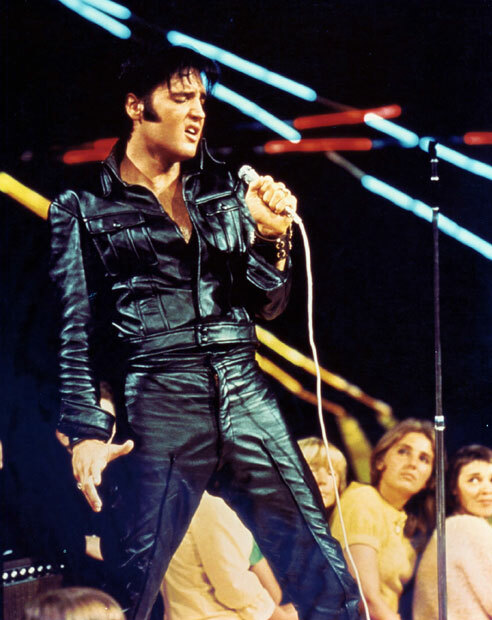 For Duncan, the color was black, as in the leather Presley wore in her favorite Presley performance, the in-the-round section of his 1968 television comeback special, titled “Elvis” and broadcast nationally Dec. 3, 1968, on NBC. Moore is too modest to acknowledge the evident point: Yes, all they changed was the music. But that music changed everything. CMA created the Country Music Hall of Fame in 1961 to recognize individuals for their outstanding contributions to the format with Country Music’s highest honor. Inductees are chosen by CMA’s Hall of Fame Panels of Electors, which consist of anonymous voters appointed by the CMA Board of Directors. © 2005-2011 EMOL.org Music Entertainment Magazine. All rights reserved. This Elvis costume includes the Jumpsuit,	Belt,	Scarf. Sunglasses and wig sold separately (NOT included). Weight 1.5lbs. Packaged with a pair of plush, paste-on sideburns, a ring, and a pair of Elvis sunglasses, this is the must-have kit for every Elvis wannabe. Whether the goal is small (to imitate Elvis authentically at a party) or lofty (to take the stage at an Elvis tribute artist event) this complete guide to reincarnation as the King takes readers step by step through the metamorphosis. Topics include: Which Elvis to be (50’s Elvis, 70’s Elvis; Movie Star Elvis, Gospel Elvis, or Rockabilly); Costumes and accessories; Hair and sideburns, How to sing like the King; The moves, stage presence, and dialect; How to be a non-white and/or non-male Elvis; The Elvis training diet (including a few recipes); And much more! Read sage advice and testimonials from professional Elvis tribute artists, pick up little-known facts about your idol, and cash in on the subtle secrets to achieving the essence of Elvis.